President. B.A., St. Vincent’s College; M.A., Ph.D., University of Maryland. Provost and Vice President for Academic Affairs. B.A., Avila University; M.A., University of Missouri-Kansas City; Ph.D., University of Kansas. Vice President for Advancement and External Relations. B.S.B.A., University of Missouri-Columbia. Vice President for Enrollment Management and Athletics. B.A., Buena Vista; M.Ed. University of St. Mary. Vice President of Finance. B.S.B.A., Finance and Banking, B.S.B.A., Real Estate, M.B.A., University of Missouri-Columbia. Director of Mission Effectiveness and Campus Ministries. B.A., Benedictine College; M.P.S., Loyola University. Director of Student Life. B.F.A., M.S., Emporia State University. Senior Director of Admissions. B.A., College of Saint Benedict; M.S., Avila University. Director of Financial Aid. B.B.A., M.S., Fort Hays State University. Associate Dean, School of Professional Studies. B.A., M.S., Avila University. Coordinator of Information Management. B.S., University of Florida; M.A., Kansas State University. Registrar and Director of Registration and Student Records. B.A., Hannibal-LaGrange University; M.A., Olivet Nazarene University. Director of Maintenance, Residence Life. Enrollment and Retention Manager, Graduate Psychology. B.A., M.A., MidAmerica Nazarene University. Assistant Vice President of Student Development and Success. B.A., Western Washington University; M.A.,Virginia Technical University. Director of International Student Services. B.A., Bethel College; M.A.Ed., Oral Roberts University. Senior Director of Development - Alumni and Annual Fund. B.S.B.A., Rockhurst University; M.S., DePaul University. Director of Graduate Education. B.S., University of Missouri-Kansas City; M.E., Graceland University; Ed.D., St. Louis University. Director of Graduate and Advantage Admission. B.A., The University of Kansas; M.A., Wheaton College. TRIO Project Director. B.A., Midland University; M.A., Creighton University. Director of Human Resources. B.G.S., University of Kansas; M.S., Baker University. Assessment Coordinator and Certification Officer. School of Education. B.A., M.A., Indiana University of Pennsylvania. Director of Major Gifts. B.A., Northeastern University. Senior Director of Development - Major Gifts. B.A., University of Memphis; M.P.A., University of Missouri-Kansas City. Senior Director of Marketing and Communications. B.S., University of Kansas. Controller. B.S., Midland Lutheran College; M.B.A., Bellevue University. President Emerita. B.M., Fontbonne University; M.M., University of Illinois. Provost Emerita. B.A., Fontbonne University; Ph.D., University of Kansas. Assistant Professor of Business and Interim Dean of the School of Business. B.S., Kansas State University; M.B.A., Avila University; Ph.D., University of Kansas. Instructor. B.S.N., University of Kansas. Associate Professor of Art + Design. B.F.A., Kansas City Art Institute; M.F.A., Parsons School of Design. Assistant Professor of English and Artist-in-Residence, B.A., M.A., University of Missouri-Kansas City. Associate Professor of Accounting. B.S.B.A., Rockhurst University; M.A.S., University of Illinois; Ph.D., University of Missouri-Columbia. Assistant Professor of Nursing. B.S.N., M.S.N., University of Kansas. Assistant Professor of Nursing. B.S.N., South Dakota State University; M.S.N., University of Nebraska, Medical Center. Assistant Professor of Nursing. B.S.N., University of Nebraska-Lincoln; M.S.N., University of Missouri-Columbia. Assistant Professor of Nursing. B.A., Arizona State University; B.S.N., Saint Luke’s College of Nursing; M.S.N., University of Missouri-Columbia. Professor of Vocal Music and Chair of Music. B.S., M.M., University of Missouri-Columbia; D.M.A., University of Missouri-Kansas City. Associate Professor of Psychology. B.A., University of California-Irvine; Ph.D., University of Missouri-Kansas City. Professor of Business and Director of Undergraduate Business Development. B.S., M.B.A., Missouri State University; Ph.D., University of Texas. Assistant Professor of Biology. B.S., Stetson University; Ph.D., Mayo Clinic College of Medicine. Instructor of Kinesiology and Director of the Avila Athletic Strength and Conditioning Program. B.S., University of Central Missouri; M.S., California University of Pennsylvania. Assistant Professor of Education and Director of Clinical and Field-Based Experiences. B.S.E., M.S.E., Ed.D., University of Kansas. Professor of Religion and History. B.S., M.A., Kansas State University; Ph.D., University of Kansas. Assistant Professor of Chemistry. B.S., Truman State University; Ph.D., University of Missouri-Columbia. Professor of Biology. B.A., Oberlin College; Ph.D., Pennsylvania State University. Assistant Professor of Education. B.S., University of Kansas; M.S., Kansas State University; Ph.D., University of Missouri-Kansas City. Assistant Professor of Communication and Dean of the School of Visual and Communication Arts. B.A., University of Denver; M.F.A., University of Iowa. Professor of Biology. B.S., M.S., Ph.D., Kansas State University. Instructor of Biology and Science Laboratory Manager. M.A., Pittsburg State University; M.S., University of Kansas. Assistant Professor of Nursing. B.S.N., Bowling Green State University; M.S.N., University of Missouri-Kansas City. Professor of Education and Dean of the School of Education. B.A., MidAmerica Nazarene University; M.A., Southern Nazarene University; Ph.D., University of Missouri-Kansas City. Associate Professor of Biology and Chair of Biology. B.A., Rice University; Ph.D., University of Texas at Austin. Associate Professor of Psychology. B.S., University of New Haven; M.A., Adelphi University; Ph.D., Michigan State University. Professor of Management. B.S., University of Calcutta; Ph.D. University of Southern California. Associate Professor of Business. B.A., Graceland University; J.D., University of Missouri-Kansas City. Assistant Professor of Economics. B.A., University of Minnesota, Morris; M.S., Baylor University; M.S., Ph.D., University of Wisconsin-Madison. Professor of Theatre and Dean of the College of Liberal Arts and Social Sciences. B.S., Kansas State University; M.A., Wichita State University; Ph.D., University of Kansas. Assistant Professor of Education. B.A., Middle East Technical University; M.A., Ohio University; Ph.D., University of Missouri. Professor of Communication. B.A., University of Missouri; M.S., Webster University; Ph.D., University of Kansas. Associate Professor of Theatre and Director of Technical Theatre and Design. B.S., Kansas State University; M.F.A., University of Missouri-Kansas City. Associate Professor of Mathematics and Chair of Mathematics. B.S., M.S., South Dakota State University; Ph.D., The University of Montana. Assistant Professor of Radiologic Science and Chair of the Radiologic Science Department. B.S.R.T., Avila University; M.S.Ed., Kansas State University. Associate Professor and Director of Faculty and Curriculum for the School of Professional Studies. B.A., Upper Iowa University; M.P.A., Ph.D., University of Missouri-Kansas City. Associate Professor of Physics. B.S.,Wichita State University; Ph.D. University of Iowa. Assistant Professor of Education and Director of Graduate Education. B.S., University of Missouri-Kansas City; M.E., Graceland University; Ed.D., St. Louis University. Assistant Professor of Nursing. B.S.N., Saint Luke’s College; M.S., Baker University; M.S.N., Webster University. Assistant Professor of Computer Science and Chair of Computer Science. B.S., M.S., Northwest Missouri State University; M.S., Avila University. Artist-in-Residence in the Department of Music. B.S., M.A., University of Kansas; D.M.A., University of Texas at Austin. Assistant Professor of English. B.A., Rockhurst University; M.A., Ph.D., Saint Louis University. Associate Professor and Chair of the Kinesiology Program. B.A., MidAmerica Nazarene University; M.S., Ph.D., University of Kansas. Assistant Professor of Radiologic Science. B.S.R.T., Avila University; M.S.Ed., Kansas State University. Professor of Education. B.S., Northwestern University; M.A., University of Missouri-Kansas City; Ph.D., University of Kansas. Lecturer in Psychology. B.A., Saint Mary College; M.S. 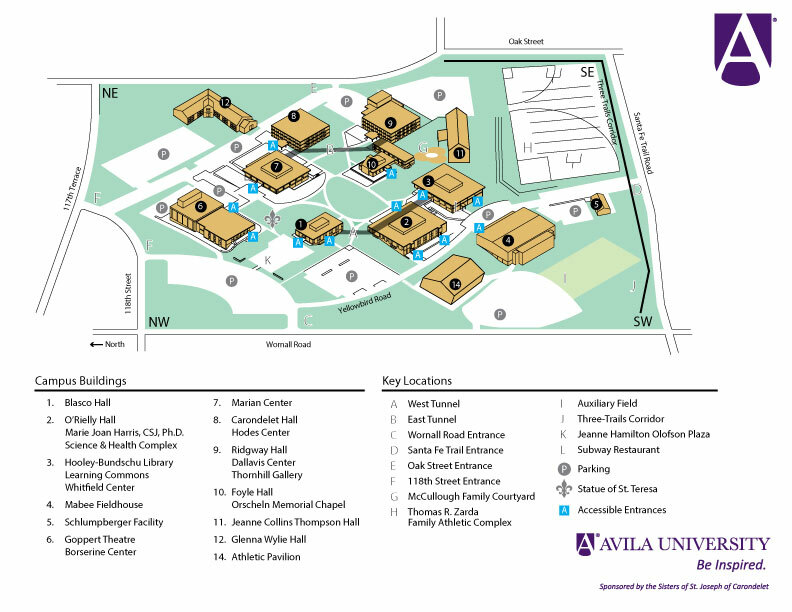 Avila University. Associate Professor of English and Chair of the English Department. B.B.A., Texas Wesleyan University; M.H., University of Dallas; Ph.D., Texas Christian University. Assistant Professor of English. B.A., The University of Scranton; M.A., University at Buffalo; Ph.D., University of Toronto. Visiting Instructor of Computer Science and Software Engineering. B.S., University of Warwick; M.S., University of Missouri-Kansas City. Assistant Professor of Mathematics. B.A., University of Haifa (Israel); Ph.D., University of Toronto. Professor of History and Chair of the History Department. B.A., Western Illinois University; M.A., Ph.D., University of Iowa. Assistant Professor of Psychology and Director of Counseling Psychology. B.A., Baker University; M.S., Ph.D., University of North Texas. Associate Professor of Social Work and Chair of the Social Work Department. B.A., M.S.W., Loyola College; Ph.D., The Catholic University of America. Associate Professor of Philosophy and Director of the Center for Global Studies and Social Justice. B.A., Taylor University; M.A., Ph.D., Michigan State University. Assistant Professor of Communication. B.F.A., Texas State University; M.F.A., Ohio University. Professor of Psychology and Chair of the Psychology Department. B.S., Tulane University; Ph.D., University of Missouri-Columbia. Assistant Professor of Education. B.A., University of Kansas; M.A., Rockhurst University; Ph.D., University of Missouri-Kansas City. Professor of Psychology. B.A., Gustavus Adolphus College; M.A., Ph.D., Stony Brook University. Assistant Professor of Criminology and Chair of the Department of Law and Justice. B.A., University of Washington; M.A., Ph.D., University of California-Riverside. Assistant Professor in Computer Science. B.A., Bombay University; M.S., M.I.S., Northern Illinois University; Ph.D., University of Kansas Medical Center. Associate Professor of Nursing and Interim Dean of the School of Nursing. B.S.N., Illinois Wesleyan; M.S., University of Illinois; Ph.D., University of Kansas. Assistant Professor of Chemistry. B.S., Wayne State University; Ph.D., The University of North Carolina at Chapel Hill. Instructor of Nursing. B.S.N., M.S.N., University of Missouri-Kansas City. Assistant Professor of Psychology. B.A., M.A., Truman State University; Ph.D., University of Missouri-Kansas City. Associate Professor of Religious Studies and Women’s & Gender Studies. B.A., M.A., Missouri State University; Ph.D., University of California-Santa Barbara. Professor of Communication. B.A., University of Kansas; M.P.A., Ohio State University; Ph.D., Walden University. Associate Professor of Psychology. B.A. University of Kansas; M.S., Avila University; Ph.D., Capella University. Associate Professor of Chemistry and Dean of the School of Science and Health. B.S., University of Pittsburgh; Ph.D., Case Western Reserve University. Instructor of Nursing. B.S.N., Union College; M.A., Webster University. Associate Professor of Psychology. B.S., Northern Kentucky University; M.A., Ph.D., Miami University. Assistant Professor of History. B.A., University of Maryland; M.A., Ph.D., Bowling Green State University. Assistant Professor and Field Director for the Social Work Program. B.S.W., B.A., M.S.W., University of Iowa. Associate Professor of Art + Design and Chair of Art + Design. B.F.A., M.F.A., Kansas State University. Instructor of Nursing. B.S.N., Rockhurst University; M.S., University of Central Missouri. Assistant Professor of Catholic Studies. B.A., Northern Arizona University; M.A., Ph.D. Graduate Theological Union; M.Div., Pacific School of Religion; CSJA. Assistant Professor of Finance. B.A., Nankai University, China; M.S., Southern Illinois University, Edwardsville; Ph.D., Temple University. Professor Emerita. B.A., Westminster College; M.A., Ph.D., Miami University. Professor Emerita. B.A., University of Iowa; M.A., Drake University; Ph.D., University of Iowa. Professor Emerita. B.A., Fontbonne University; M.A., St. Louis University. Professor Emeritus. B.S.E., M.S., Emporia State University; Ph.D., The University of Kansas. Professor Emerita. B.S., Avila College; M.S., Kansas State University. Professor Emeritus. B.S., M.S., Ph.D., Purdue University. Professor Emerita. B.A., Luther College; M.A., Governors State University; Ed.S., University of Missouri-Kansas City; Ed.D., University of Kansas. Professor Emerita. B.S.N., University of Missouri-Columbia; M.S., University of Colorado. Professor Emerita. B.A., University of California; Ph.D., Northwestern University. Professor Emeritus. B.A., University of Missouri-Columbia; M.A., University of Missouri-Kansas City; Ph.D., University of Missouri-Columbia. Professor Emeritus. B.A., M.S., Ph.D., The University of Kansas. Professor Emerita. B.A., M.S., Ph.D., University of Missouri-Kansas City. Professor Emeritus. A.B., Ball State University; M.B.A., D.B.A., Indiana University. Professor Emerita. B.A., University of Missouri-Kansas City; M.L.A., Baker University. Professor Emerita. B.A., Fontbonne University; M.A., Fordham University; M.A., University of Exeter. ; Ph.D. Candidate, University of Kansas. Professor Emeritus. B.A., University of Puget Sound; M.A., Ph.D., University of Arizona. Professor Emeritus. B.A., University of South Florida; M.A., University of Iowa; D.A., Illinois State University. School of Professional Studies. B.S., California State University; M.H.R.M., Keller Graduate School of Management. School of Education - ILCP. B.A., Park University; M.A., Webster University Ph.D., University of Missouri-Columbia. College of Liberal Arts and Social Sciences. B.F.A., Sam Houston State University. College of Liberal Arts and Social Sciences. B.A., University of Missouri-Kansas City; M.S., Avila University. School of Professional Studies. B.S.B.A., M.B.A., Avila University. School of Professional Studies. B.S., Avila University; M.S., University of Central Missouri. School of Nursing. B.S.N.,University of Central Missouri; M.S.N., University of Kansas. Lecturer in Business, School of Professional Studies. B.A., University of Michigan; J.D., University of Missouri-Kansas City. School of Business. B.A., University of Missouri-Kansas City; M.B.A., Avila University. Lecturer, School of Professional Studies. B.A., William Paterson University; M.A., M.P.A., M.B.A., University of Missouri-Kansas City. School of Professional Studies. B.S., Kansas State University; M.A., University of Missouri-Kansas City; Ed.D., University of Missouri-Columbia. School of Science and Health. B.B.A., M.B.A, University of Missouri-Columbia. School of Professional Studies. B.A., University of Kansas; M.A., University of Texas-Dallas; Ph.D., St. Louis University. School of Visual and Communication Arts. B.F.A. Swain School of Design; M.F.A., Parsons School of Design. School of Education-ILCP. B.A., College of the Ozarks; M.A., Lincoln Christian University. School of Professional Studies. B.S., Upper Iowa University; M.A., Marquette. College of Liberal Arts and Social Sciences. B.A., M.A., University of Missouri-Kansas City. College of Liberal Arts and Social Sciences. B.A., University of California-Davis; M.A., University of Alaska-Anchorage. School of Business. B.S., M.S., Iowa State University. College of Liberal Arts and Social Sciences. B.A., California State University-Chico; M.A., Graduate Theological Union-Dominican School of Philosophy and Theology; Ph.D. Candidate, University of Missouri-Kansas City. School of Education. B.S., M.S., Avila University. College of Liberal Arts and Social Sciences. M.M., State University of New York-Stony Brook; D.M.A., Manhattan School of Music. College of Liberal Arts and Social Sciences. B.A., M.A., Wichita State University; Ph.D., University of Kansas. School of Science and Health. B.S., Drury University; M.S., Missouri State University. School of Business. B.A., Park University; M.S., University of Alabama in Huntsville; Ph.D., University of Phoenix. School of Education - ILCP. B.S., Kansas State University; M.S., MidAmerica Nazarene University. School of Business. B.S., University of Missouri-Columbia; M.A., University of Missouri-Kansas City. School of Science and Health. M.S., Ph.D., Southern Illinois University at Carbondale Illinois. School of Education. B.A., University of Missouri-Kansas City; M.A., Webster University. School of Education. B.A., William Jewell College; M.S., Central Missouri State University. College of Liberal Arts and Social Sciences. B.A., M.A., University of Nebraska at Omaha; Ph.D., University of Nebraska-Lincoln. School of Science and Health. B.S., M.S., University of Central Missouri. School of Education. B.S.N., University of Missouri-Columbia. School of Professional Studies. B.A., Loyola University; M.L.A., University of Chicago. School of Visual and Communication Arts. B.F.A., Avila University. School of Business. B.A., University of Missouri-Columbia; Ph.D. Harvard University. School of Education. B.S., M.A., University of Missouri. School of Education. B.A., Missouri Valley College; M.S., University of Missouri-Kansas City. School of Professional Studies. School of Education. B.S., Southwest Baptist University; M.S., Kansas State University. School of Professional Studies. B.A., University of Central Missouri; M.A., University of Missouri-Kansas City. School of Education. B.S., Oakland University; M.A., Avila University. College of Liberal Arts and Social Sciences. B.A., University of Missouri-Kansas City; M.F.A., Ohio University. School of Business. J.D., University of Kansas School of Law. School of Nursing. B.S., Southeast Missouri State University; M.S., University of Kansas Medical Center. School of Education-ILCP. B.A., University of Wisconsin; M.A., Northeastern Illinois University. School of Nursing. B.S.N., M.S.N., Research College of Nursing. College of Liberal Arts and Social Sciences. B.M., Missouri State University; M.M., Northern Illinois University. School of Professional Studies. B.S., Missouri State University; M.S., University of Kansas Medical Center. School of Education. B.A., William Jewell College; M.A., University of Missouri-Kansas City. School of Professional Studies. B.S., University of Wyoming; M.A., Antioch University. School of Professional Studies. M.S., Ph.D., University of the West of England. School of Education. B.A., University of Notre Dame; M.A., University of Kansas. School of Professional Studies. B.S., University of Cincinnati; M.A., University of Illinois; M.B.A., Avila University. School of Education. B.A., University of Kansas; M.A., Avila University; Education Specialist, University of Missouri-Kansas City. School of Education. B.A., William Jewell College; M.Ed., Rockhurst University. School of Visual and Communication Arts. M.F.A., Kansas State University. College of Liberal Arts and Social Sciences. M.A., Avila University. College of Liberal Arts and Social Sciences. B.F.A., Kansas City Art Institute; M.A., University of Central Missouri; M.F.A., University of Kansas. College of Liberal Arts and Social Sciences. M.A., Ph.D., Boston College. School of Education. B.S., Avila University; M.A.Ed., Baker University; Ed.D., Walden University. College of Liberal Arts and Social Sciences. B.A., Ph.D., University of Sydney. School of Professional Studies. B.S., M.S., University of Kansas Medical Center. College of Education. B.S., Avila University; M.A., Baker University; M.S., University of Phoenix; Doctoral Candidate, Baker University. School of Business. B.S., University of Missouri; M.B.A., Rockhurst University. College of Liberal Arts and Social Sciences. B.A., St. John’s College; M.F.A., University of Missouri-Kansas City. School of Education. B.A., University of Kansas; M.A., University of Missouri-Kansas City. College of Liberal Arts and Social Sciences. B.A., St. Mary’s Seminary College; M.Div., St. Mary’s Seminary and University. School of Education-ILCP. B.S., Truman State University; M.A., Avila University. School of Education. B.S., Avila University; M.A., University of Missouri-Kansas City; Ph.D. Candidate, University of Kansas. School of Business. B.S.B.A., Kansas State University; M.B.A., Avila University. Intensive Language and Culture Program. Bachelor and Master, Voronezh State University, Russia: M.Ed., Park University. School of Professional Studies. B.S.N., M.A., University of Kansas; M.P.A., University of Missouri-Kansas City. School of Education. B.S., University of Kansas; M.S., University of Missouri-Kansas City. College of Liberal Arts and Social Sciences. B.A., University of Arkansas; M.A. University of Illinois-Urbana-Champaign. School of Science and Health. M.S., Ph.D., University of Missouri-Kansas City. College of Liberal Arts and Social Sciences. B.A., M.S., Avila University. School of Visual and Communication Arts. B.A., Avila University; M.A., University of Missouri-Kansas City. School of Science and Health. B.A., Avila University; M.S., University of Missouri-Columbia. College of Liberal Arts and Social Sciences. M.M., University of Nebraska; D.M.A., University of Missouri-Kansas City. School of Professional Studies and School of Education. B.A., MidAmerica Nazarene University; M.A., Nazarene Theological Seminary; M.B.A., Avila University; M.S., Avila University; Ph.D., University of Kansas. School of Visual and Communication Arts. B.A., M.A., Park University. School of Education. B.A., University of Missouri-Kansas City; M.A., Avila University. School of Science and Health. B.A., State University of New York at Buffalo; D.C., Cleveland Chiropractic College-Kansas City. School of Visual and Communication Arts. B.F.A., Kansas City Art Institute; M.A., University of Central Missouri. School of Education. B.A., M.A., Indiana University of Pennsylvania. School of Science and Health. B.S., Wichita State University; M.P.H., Wichita State University and The University of Kansas Medical Center. School of Education - ILCP. M.A., Ph.D., University of Iowa. School of Science and Health. B.S., University of Kansas; Ph.D., University of Kansas Medical Center. School of Education. B.S., University of Central Missouri; M.A., University of Missouri-Kansas City; Ph.D., University of Kansas. School of Business. B.S., University of Missouri-Columbia; M.B.A., University of Phoenix-Houston. School of Education-ILCP. B.A., Creighton University; M.A., University of Missouri-Kansas City. School of Science and Health. B.S., Kansas State University; Ph.D., University of Missouri-Kansas City. College of Liberal Arts and Social Sciences. B.A., Ph.D., University of Nottingham. College of Liberal Arts and Social Sciences. M.A., University of Nebraska-Lincoln. College of Liberal Arts and Social Sciences. B.F.A., Avila University. School of Visual and Communication Arts. B.A., Avila University. School of Education. B.S. University of Central Missouri; M.S., Avila University; Ed.D., St. Louis University. School of Education. B.S., Northwest Missouri State University; M.Ed., Kansas State University. College of Liberal Arts and Social Sciences. B.A., Newman University; M.A., The Chicago School of Professional Psychology. School of Science and Health. B.A., St. Olaf; Ph.D., Oregon Health Sciences University. School of Education. B.S., Central Missouri State University; M.A., Baker University; Education Specialist, William Woods University; Ed.D., University of Missouri-Columbia. College of Liberal Arts and Social Sciences. B.M., Washburn University of Topeka; M.M., D.M.A., University of Missouri-Kansas City. School of Professional Studies. B.S., Rutgers University; M.B.A., Drexel University. School of Education. B.S., Central Missouri State University; M.A., Webster University. College of Liberal Arts and Social Sciences. B.S., University of Central Missouri; M.S., University of Missouri-Kansas City. School of Visual and Communication Arts. B.A., Missouri Southern State College; M.A., Webster University; J.D., John Marshall Law School. School of Education. B.A., Kansas State University; M.A., University of Missouri-Kansas City. School of Education. B.A., Southwest Baptist University; M.A., Southwest Missouri State University. College of Liberal Arts and Social Sciences. B.A., Marist College; M.A., State University of New York (New Paltz); Ph.D., Duke University. School of Professional Studies. B.A., Bennington College; M.A., Northwestern University. School of Education. B.S., Indiana University of Pennsylvania; M.Ed., MidAmerica Nazarene University; Education Specialist, Central Missouri State University. School of Education. B.S., Indiana University; M.A., Avila University. School of Nursing. B.S.N, M.S.N., University of South Alabama. School of Visual and Communication Arts. B.F.A., Savannah College of Art & Design. School of Professional Studies. B.B.A., Pittsburg State University; M.Ed., Avila University. School of Science and Health. B.S., University of Missouri-Kansas City; M.A., Webster University. College of Liberal Arts and Social Sciences. M.A., University of Missouri-Kansas City. School of Education. B.S., University Central Missouri; M.A., Webster University; Ed.D., St. Louis University. College of Liberal Arts and Social Sciences. B.A. University of Hawaii; M.E.D., Seattle University. School of Professional Studies. B.A., Pontifical College Josephinum; M.A., Catholic University of America. School of Science and Health. B.S.B.A., Avila College; M.S., University of Central Missouri. School of Professional Studies. B.A., Rockhurst University; M.A., University of Missouri-Kansas City; M.A., Pittsburg State University. School of Professional Studies. B.S.B.A., University of Missouri-Columbia; CPA. ; M.B.A., Benedictine College. School of Professional Studies. B.A., Coe College; M.A., University of Kansas. School of Business. B.S., Iowa State University; M.A., Michigan State University. School of Education. B.A., University of Pennsylvania; M.Ed., George Mason University. School of Science and Health. B.S.N., Avila University; M.S.N., University of Missouri-Kansas City; Ph.D., University of Kansas. School of Business. B.S., Washington University; J.D., University of Notre Dame Law School. Radiologic Science. B.S.R.T., R.T.(R), Avila University. Radiologic Science. R.T.(R), Penn Valley Community College. Radiologic Science. B.S., University of St. Francis; R.T.(R)(T). Radiologic Science, R.T.(R), Research Medical Center. Radiologic Science. B.S., R.T.(R), Free Will Bible College. Radiologic Science. B.S., R.T.(R), Avila University.